Today I’m glad to present Grant Leishman, whose book “The Second Coming” I really loved. It is a thoughtful and quirky take on The Second Coming of Christ. I’ve attached some reviews at the end of this feature. He has also just released “A Drop in the Ocean”, which I also adored. It is a beautiful and bittersweet romance with insights into life in the Philippines that shows a lot of sensitivity. But the interview first. Hello Grant, welcome to my blog. Please tell my readers, how did you come to writing? Now, I am a full-time writer, based in the beautiful islands of The Philippines and I believe I can truly say, I am now “living the dream”. In one word – writing is my bliss! I like to ask myself what if? questions. In the case of The Second Coming, it was a tad more pragmatic than that. I remember thinking, well, this is my first book and I want it to be a best-seller. What is selling at the moment? I looked around and at the time and what was selling was a book about someone receiving a phone-call from heaven. Aha! The light went off – God sells! I was wrong – God doesn’t sell, but that’s another story altogether. I asked myself; what if God looked down on Earth? What would he think of what humanity has done to his creation? My conclusion was that God would be pissed! The story developed from that thought. The sequel to this book will be released in December and is called Rise of the AntiChrist. The third and final book, called Holy War is about 15K done and will hopefully come out in March or April next year. My latest book, Just A Drop in the Ocean was inspired by my life story to some extent and “heavily” fictionalised. Without a doubt my favourite character in The Second Coming Series is Maria Manyanan (Ma.) She made the mistake of falling in love with the Son of God and it seems that nothing but calamity has befallen her and their family from this love. Yet, she remains steadfast and loyal, to the end….or does she? We’ll have to see, in the third book. I far greater enjoy writing female characters than men. I find there is much greater scope for emotional development and interaction in a female character. JC would be difficult to cast, but I could envisage him perhaps being played by Leonardo Di Caprio, of a few years ago (he’s getting a bit old for the role now), so that being that case of today’s kleading men, I’d plump for Bradley Cooper. If we are talking about The characters from The Second Coming series, I suspect I would be compared to Chog and Dan-dan, the two characters who betrayed JC and ran off with the Church’s millions; later to reappear in Rise of the AntiChrist and Jesus and Chito. I’d like to think I am most like the character of Ange; short, fat and funny, but always sees the positive side of everything and is always guaranteed to cheer everyone up, even in the face of disaster. I’m sure every writer says the same, but I’d like to think there’s a bit of me in every character. I think I might be what is termed, in the literary world, as a pantser. I write by the seat of my pants. I rarely, if ever, know what is going to happen in the next chapter. Usually, the next chapter’s plot and action comes to me when I have a break in the current chapter I’m writing. Touch wood, I haven’t hit a block thus far. One word – Bliss! Writing is where I’m happiest. I say, as a full-time author, living in such a beautiful country, married to the most amazing woman, I truly am “living the dream” and that’s not a cliché, that’s my true belief. The over-arching idea behind my series is that there is an inherent good in humanity that can be attained. We have the power to achieve such greatness and yet we allow ourselves to be swayed by ideologies, dogma and fanaticism. I wanted to try and show that humanity is indeed worth saving. There are many other underlying ideas in my works, such as; love conquers all, community is everything and God is not religious, he is spiritual. I can worship God, as I see him, in a Church, a Synagogue, a Mosque, a Temple or on top of a bloody mountaintop. He does not care – only we do. The best aspect of writing is the rewards – and I don’t mean money. Nothing compares to opening that box and taking out the books with your name on them. It is heaven. The best fun you can have in life, with your pants still on! The worst aspect – authors who feel they are competing with you and have to put you down. I compete with nobody – I celebrate their successes as much as my own. There is not a writer in this Universe that writes what I write. I am unique and so are they. This is not a competition. It’s a juggling act. Most authors will tell you they hate marketing. I’m not sure I hate it. I love interacting with other authors and that’s a big part of marketing. It’s hard to get the balance right, but you do what you can do and you have to be satisfied with that. For me, I split my day – writing in the morning and social media (marketing) in the afternoon – it’s hard. I read – voraciously. I no longer read legacy authors though, only “indie” authors and damn, there are some awesome “indie” authors out there. Mundane – The only thing I really miss from New Zealand, is Beetroot – it’s so damn hard to find here. My books are me and I am my books – it’s that simple. I self-edit (the joys of poverty). I edit once for content. I edit twice for grammar and spelling (not my strong point – the grammar part anyway) and I edit one final time for a final check. As an ex newspaper reporter, I am reasonably good at spotting errors, but the fact is self-editing is very, very difficult. I do my best to quality control, but I’m sure some mistakes still slip through. Actually I enjoyed it. It’s quite fiddly getting the ebook set up just right and then the paperback version, but there’s a real satisfaction at the end. I’m so proud of my latest effort; Just A Drop in the Ocean – apart from the cover, I did it all myself. Yay Me! Frankly, it was fun. There are so many great ones out there: I hate to leave some out, but my top five so far are: Angela Gascoigne, Rachel McGrath, May Panayi, Jana Petken and Tom Hodden. Sorry, I have to make it six – I can’t leave out Colin Griffiths. These days – as above. I used to read Grisham, Clancy and Cussler, but once I started reading the “indies”, I realised just how formulaic those legacy authors are. Well, I have a PHD in not suffering fools lightly and an Olympic Gold Medal in sarcasm, so I would choose that first, although my loyalty to those I believe in and love is unbreakable. The sequels to The Second Coming; Rise of the AntiChrist and Holy War continue the saga of JC and his family in saving humanity from itself. Just A Drop in the Ocean is a very personal novel that explores the quest for happiness. It is a love story that spans continents and a generation. It is a powerful affirmation of one of my core beliefs; that love truly does conquer all. I am very proud of this work. The video trailer for my book has the music of the 1812 Overture, but if I was to choose a song to actually go with it, it would have to be from the rock opera Jesus Christ Superstar and it would be Mary Magdalene’s Song; He’s a man, just a man. With grace and dignity – yeah right! It hurts, anyone that says it doesn’t is lying, but the truth is some people love my book and my style and that’s who I write for. If you don’t like it, no problem – change the channel and buy something else. Starting with a man awakening from a coma and trying to regain his memory this had an instant pull. A slow reconstruction of JC’s life introduces heavenly elements and soon the religious and biblical connection becomes more transparent. It took me while to accept this modernised ‘second coming’ and the fictional use of biblical characters and God. However, after a while I eased into it and found that the concept worked indeed very well. The message of the book is delightful and while some elements of the writing may not sit well with some readers, the tone and outcome are very apt for this Christian reader. Philosophical, reflective and thoughtful as well as entertaining. This was brilliant – creative, imaginative and completely off the wall, but the story has a great underlying tone about humanity and how we potentially need to stop and think about where we are going! The characters are endearing, I fell in love with JC and Ma (the modern day Jesus and Mary Magdalene) and his unconventional group of disciples…. I must admit that before I read this I really wondered how the author would make this concept, story and even its location in the Phillipines work wonderfully – but honestly it came together brilliantly! I’ve already recommended this read to someone else and passed on the paperback. This was a truly inspiring and enjoyable read! Grant gifted me this book to read and I fell in love with the theme right away. 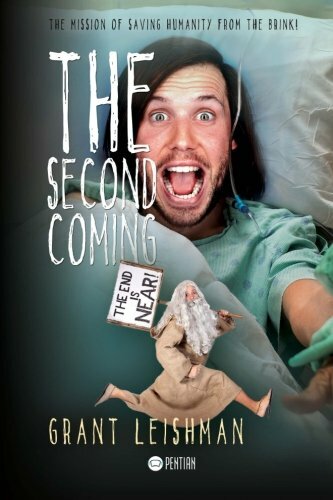 In The Second Coming, Grant Leishman has given the world a very thoughtful, entertaining, soul searching read hoping for peace to come to all. There are a few grammar errors in this book but they don’t detract from the power of the messages his book contains. A great interview with Grant, very interesting. I liked his answers to the best and worst about writing and brilliant answer to the lonely island question. Internet access in parts of the Uk would be a start!